All filtering commands are available under Filter tab. Clear applied filter. If post audit filter was applied then this will revert it back to initial audit results. Apply selected filter group as the post audit filter. 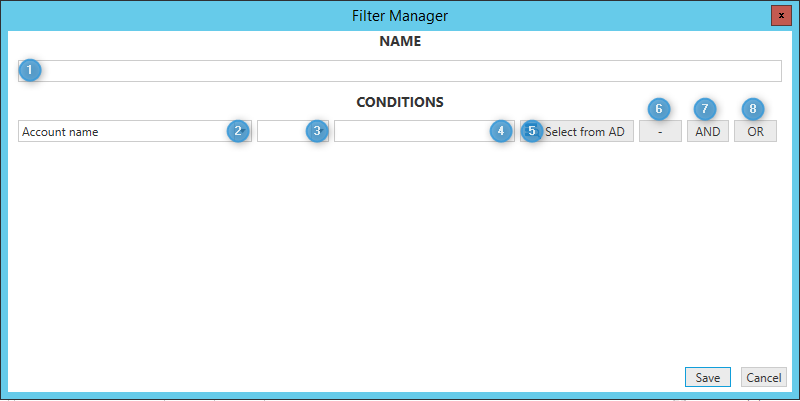 You can create or edit filter with filter manager. Select the filter operation. Each field has its own set of available filter operations. Enter the filter operation value. Every field and its operation have their own value type, for example, it can be a textbox, dropdown, Active Directory object or other. If You have selected field, which accepts Active Directory value, then You can lookup its value.